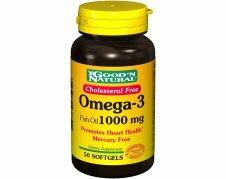 Omega-3 Fish Oil 1000mg contains EPA and DHA. If you are pregnant, nursing, taking any medications, or planning any medical procedure, consult your doctor before use. Discontinue use and consult your doctor if any adverse reactions occur. This product contains fish (herring, anchovy, mackerel, sardine, salmon) ingredients. SINCE 1980, GOOD ‘N NATURAL HAS BEEN COMMITTED TO ONE GOAL: PRODUCING THE FINEST QUALITY VITAMINS, MINERALS, AND FOOD SUPPLEMENTS WE CAN. ONLY THE GOOD AND NATURAL WAY. THE GOOD ‘N NATURAL BRAND HAS MAINTAINED A STAND-OUT PRESENCE ON THE SHELVES OF HEALTH FOOD STORES FOR OVER 20 YEARS AND CONTINUES TO GAIN FAVORABLE RECOGNITION AMONG RETAILERS AND CONSUMERS ALIKE. GOOD ‘N NATURAL HAS BEEN DEDICATED EXCLUSIVELY TO THE HEALTH FOOD MARKET. OUR FOCUS REMAINS ON DELIVERING SUPERIOR QUALITY SUPPLEMENTS TO THE HEALTH FOOD STORE MARKETPLACE AT EXCEPTIONALLY LOW PRICES.